This exceptional work explores the complexities of communication at one of the most critical stages of the life experience--during advanced, serious illness and at the end of life. Challenging the predominantly biomedical model that informs much communication between seriously ill and/or dying patients and their physicians, caregivers, and families, Sandra L. Ragan, Elaine M. Wittenberg-Lyles, Joy Goldsmith, and Sandra Sanchez-Reilly pose palliative care--medical care designed to comfort rather than to cure patients--as an antidote to the experience of most Americans at the most vulnerable juncture of their lives. 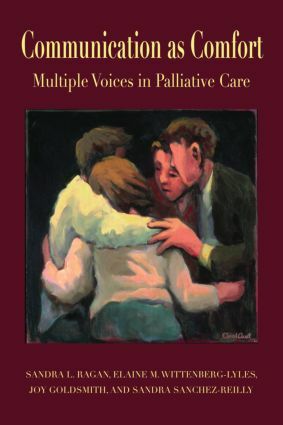 With an author team comprised of three health communication scholars and one physician certified in geriatrics and palliative medicine, this volume integrates the medical literature on palliative care with that of health communication researchers who advocate a biopsychosocial approach to health care. Applying communication theories and insights to illuminate problems and to explain their complexities, the authors advocate a patient-centered approach to care that recognizes and seeks to lessen patients’ suffering and the many types of pain they may experience (physical, psychological, social, and spiritual) during life-threatening illness. Sandra Ragan (Ph.D. University of Texas at Austin) is Professor Emerita of communication at the University of Oklahoma. She has been studying communication and palliative care/end-of-life issues for many years, and has contributed to numerous volumes on the topic, including several in the LEA list. Elaine Wittenberg-Lyles (Ph.D. University of Oklahoma) is an assistant professor at the University of North Texas, and Joy Goldsmith (Ph.D. University of Oklahoma) is an assistant professor at Young Harris College in Georgia. Sandra Sanchez-Reilly (M.D., Colegio Mayor de Nuestra Señora del Rosario, Colombia) is an assistant professor of Geriatrics and Palliative Care and the director of the Palliative Care program at the University of Texas Health Science Center and the South Texas Veterans Health Care System in San Antonio, Texas.